Within minutes of putting out a call on Twitter, I was inundated with requests. Most of them came from sales alert services themselves (or employees), but I’ll give them all a big high five for having excellent Twitter searches to let them know I and others will be looking. Since getting the best deal on something is pretty damn important to me, I tried a few that I thought would suit me. Here’s how it went, in case you need a new sale alert system! FYI, I was using all these services on my laptop, so I can’t speak to the mobile apps or versions. Update 8/6/14: Fashionista has a list of services you can try, too! Unfortunately, this was the one I liked the least. 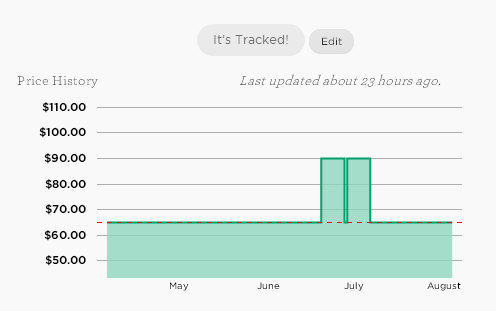 Even though there’s a pretty cool feature that tracks the history of the price (so you can see if it’s gone up or down over time), the inability to let me choose things like color, size, or sale percentage really didn’t work for me. I need to know how much I’m saving! Even though they have a nice user interface, I counted Track If out early on. Plus, they automatically connected me to Facebook, even though I didn’t use Facebook as my sign-in. It creeped me out and ruled out Track If for good. Their Chrome extension button was handy, but I’d only use Track If for checking out the history of pricing for something you’d like to buy. Update 8/5/2014: TrackIf’s people are very helpful over Twitter, and assured me they’re looking to expand into price, color, etc., tracking. @bibifatemeh This is a FB plugin. j.mp/UWmuDG. Our system does not link auto link your account to FB. It's against FB policy. While they did not automatically connect to my Facebook account, the Facebook plugin on their site did. TrackIf can argue with me about semantics all they like, but the plugin is unnecessary and seems invasive. Social share buttons would suffice if I wanted to share my tracks with all my friends (which I don’t). Covvet seemed really easy, but turned out to be really buggy. It has a Chrome extension (which I started expecting), and the layout was very simple. Until it was too simple. There was nowhere to set email alerts, which bothered me. When you’re logged in, there’s not FAQs or About or How It Works page to let you know they’ll be emailing you an alert when something you want goes on sale. And after I confirmed my email address, I still got a message on the site (both on desktop and mobile) that told me to confirm my email address. Another confusing aspect is that there are two tabs: On Sale and Everything (which is the items you Covvet). Even though one of the sandals I tagged was on sale, it didn’t show up in the On Sale tab. Neither did the Gap khakis I Covveted, which were on sale for $39. Which brings me to the most serious bug–the fact that these khakis showed up as $10.95. The website said the pair I wanted was $39. The cheapest pair was $19.99. It worried me that Covvet had a completely different price–what if I happily skipped over to Gap’s website to buy a pair of khakis for $10.95? I’d be pretty disappointed to find out they were $39 instead. And the nail in Covvet’s coffin was that they didn’t support J. Crew’s factory store. They’ll send me an email when it’s added to their supported list of stores (which, to be fair, is pretty extensive). But nobody has time for that. Update: Covvet tweeted at me immediately to help resolve the problems I’d had. I appreciated that. @bibifatemeh sorry to hear you had some trouble! J.Crew Factory was added, Gap is better, email thing is fixed. Mavatar works differently than the other services. Everyone else has an extension that you press to add something to your list of stuff to get alerts about. But Mavatar’s Chrome extension button installs a cart. When I opened the cart, there was something from Old Navy. I don’t know how it got there, so I was a bit freaked out. I also didn’t know how to put something in my cart, and the FAQs didn’t address it. After I tweeted them for help, I realized I’d have to put something into the shopping cart on the website I was visiting for it to show up in my Mavatar cart. This worked for Gap, but not for the J. Crew Factory store. Tsk, tsk! Something about having to physically put an item in my cart turned me off. Savings and coupons are applied when shopping; they don’t email you to let you know something’s on sale. Since I wanted that email, Mavatar didn’t work for me. Update: I received a nice email from Lindsey Kennedy in the Social Media Marketing department that took the time to explain how some of the processes worked and thanked me for the feedback. She explained that Mavatar’s purpose is to be completely different than all other sales alerts (which I’d definitely agree that they do) and outlined how Mavatar is doing that. It’s definitely an interesting model, but not one that I wanted. And now, the moment you (may) have been waiting for! I found my new Hukkster. I liked Shoptagr the best, folks. It reminded me of what I liked about Hukkster: it’s easy. There isn’t a Chrome extension, but they have a +Tag button, which is easily dragged to your Toolbar, so I didn’t feel inconvenienced. Shoptagr allows you to tag exactly what you want: price, color, percentage off during sale, fit. Another cool feature is that you can earn rewards when people sign up using your personal link. Or you can share via your social channels, with simple share buttons (hear that, Track If?! Nobody automatically signed me into anything). After five people sign up, you get a $10 gift card to Amazon, Asos, Topshop, or Net-A-Porter. Ten people sign up, you get a $20 gift certificate. And so on, up to $250. I don’t flatter myself a fashion influencer, but I think the chance is pretty rad. You can also set email preferences. Hallelujah! The one downside was that Shoptagr got confused when there were too many products available on one page. Since it’s pretty rare that e-retailers clutter up their pages, this wasn’t a huge problem. Update: Shoptagr emailed me to let me know that I could also receive text alerts just by changing my settings. Not a feature I plan on using, but pretty cool. 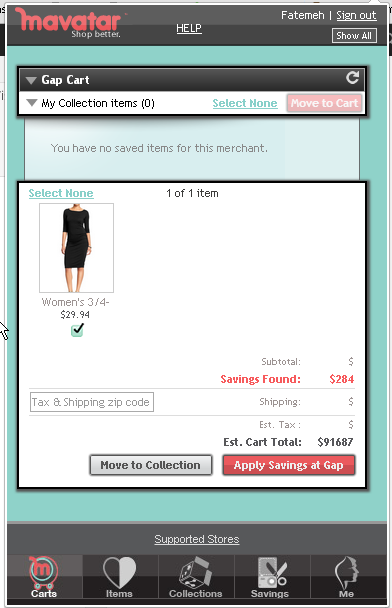 Update: Shoptagr now has a browser extension. Do you have sales alert services that you really like or use any of these services? Tell me about why you like them in the comments. Looks awesome! Everything’s in pounds; is it UK-only? It’s so cool seeing all these sites popping up everywhere! Have you tried http://LoveSales.com? That’s my fave alternative so far, what do you think? Thanks for replying! I like the updates you made, it’s cool seeing how the companies tweet with you. And yessss I still love poachit, lol, old habits die hard?? I don’t think I had any of those problems you listed! Hey, Vicky! I hadn’t seen poachit.com. Looks interesting!